Partition Magic Software Partition magic software for Windows Server 2000/2003/2008/2008 R2/2012/2012 R2, Windows XP/Vista/7/8/8.1/10, etc. So, I hope to shrink C to 100GB, and use the released space to create other 3 partitions. Nevertheless, I can’t reduce C to desired size using Windows 10 disk management. To be specific, this utility only allows me to take 254GB space though there is 485GB free space left in drive C. Why? And how can I get desired size? From Microsoft we know unmovable files, such as page file and shadow copy storage area, will not automatically relocated when we are shrinking a partition, and we cannot decrease the allocated space beyond the point where the unmovable files are located. If you want to shrink more space, moving the page file to another disk and deleting the stored shadow copies might be useful. However, if the disk only has one partition, you’ll need to shrink this partition and create a small partition at first, then move those unmovable files to the newly created partition, and finally shrink partition C again. Actually, there is a much easier solution, and it is to shrink partition using free third party partition manager. 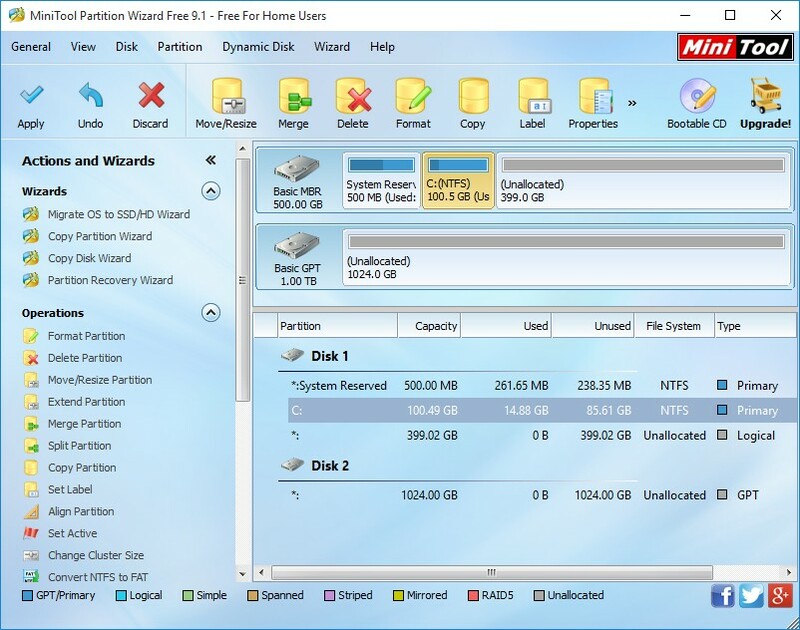 MiniTool Partition Wizard is worth trying since it is easy to use. 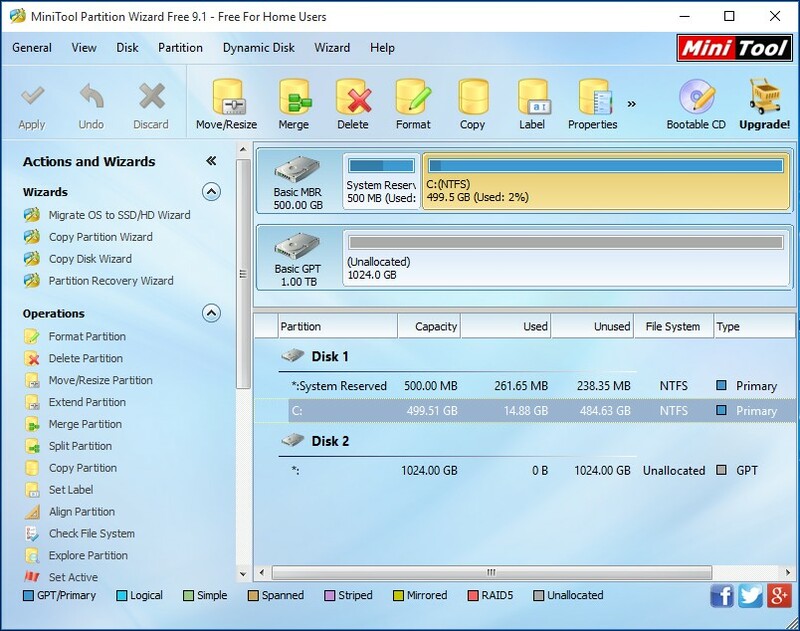 Please download and install MiniTool Partition Wizard Free Edition on your computer, and we suggest not installing it on drive C.
Now, just select the partition C and choose "Move/Resize Partition" feature from the left action panel. Here, you reduce partition C to desired size by shortening the partition handle, and then click "OK". Now we can preview partition C has been reduced to 100GB. At this time, just click "Apply" button to make all changes performed. When you are not allowed to reduce partition C to desired size in Windows Disk Management, most probably you are shrinking the allocated space beyond the point where the unmovable files are located. At this time, just use MiniTool Partition Wizard to shrink it, which only requires easy operations. Quickly Fix "The Selected Disk Is of GPT Partition Style"
Copyright (C) 2018 www.partition-magic.com, All Rights Reserved. PartitionMagic ® is a registered trademark of Symantec Corporation.